You know I love a rainbow, and this card of Bonnie's shows a clever way to use your scraps. I used distress inks to create my rainbow, but I over-stamped using Stampin' Up's Mixed Bunch to represent the patterns on Bonnie's rainbow. Wow! I love the rainbow and the touch of glitter is perfect. Really beautiful card - love the gorgeous, vibrant rainbow. I love the softness of the flower-pattrned rainbow. And, of course, the Stickles highlights it perfectly! Wow Ardyth you outdid yourself, this is fantastic! Beautiful job melding one color into the next! I really must try some distress inks if this is what can be achieved. 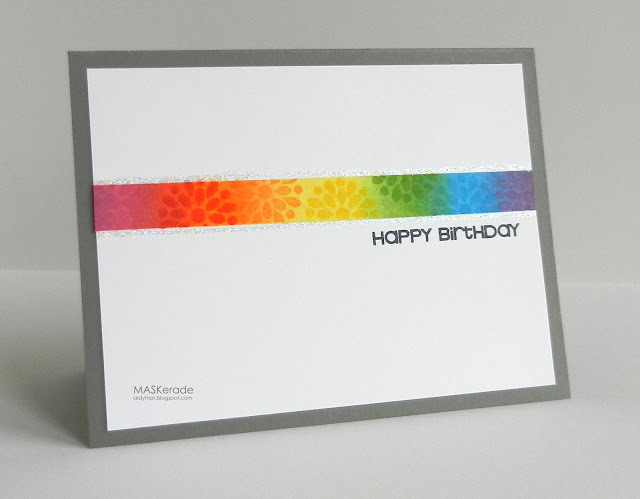 Love the over-stamp - adds a subtle bit of pop to the rainbow! Beautiful, Ardyth! I want to CASE this! ACK!! I love this one!! It's like my most favorite strip of washi tape (if I could commission a roll). Super-amazing. Love the gray border too. I can't keep my hands off gray recently. Wowzer! Your rainbow colors are so beautiful! A wonderful homage to Bonnie's card! Awesome CASE! Your masking is always so crisp and Ilove the flowers you used.